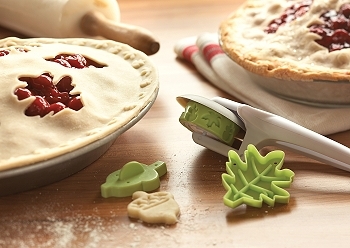 A unique new tool that crimps a decorative pattern edge into the pie crust, then cuts and removes the excess dough. 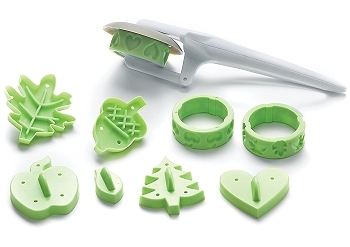 Includes specialty cutters for creating beautiful cut-outs to accent the top pie crust. 4 Decorative imprinting pattern wheels - apple, leaves, hearts and lattice. 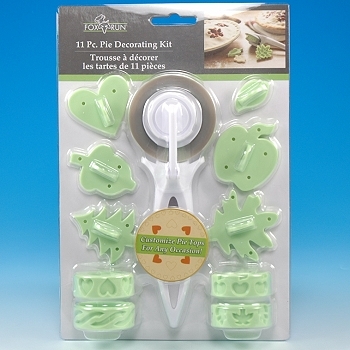 6 Decorative imprinting cutters - maple leaf, apple, acorn, heart, small leaf and Christmas tree.